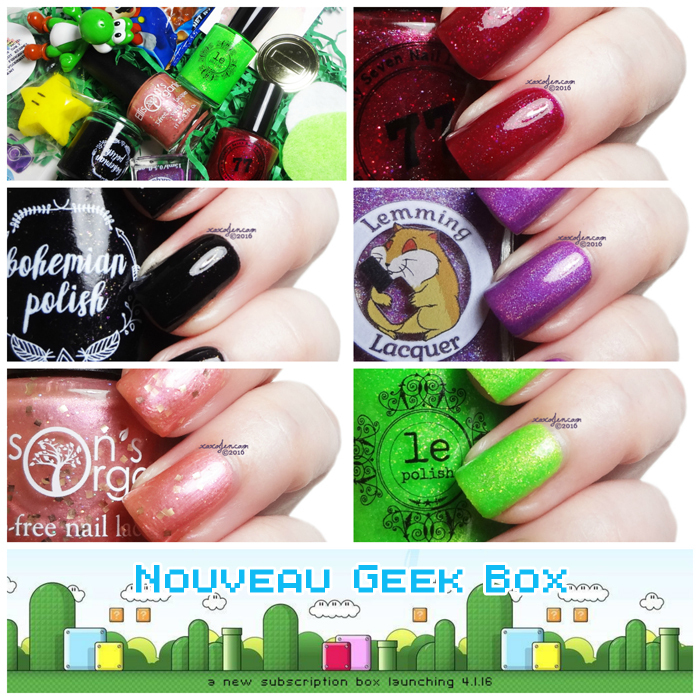 The Nouveau Geek box is a brand new monthly box containing delightfully nerdy items handcrafted for anyone with a love of video games, sci-fi, and other assorted geekery. The very first box will be available for pre-order April 1 at 11am CDT and ends at 10:59pm CDT on April 7. The very first box is Mario themed and includes five indie polishes, Super Mario 3D Gummies, a star-shaped mani bomb from Lemming Lacquer, two felt nail polish remover pads from le polish, a figurine (mine was Yoshi! ), and a Mario coin. Your Princess is in Another Castle - a buildable sheer peach shimmer with gold glitters. I wore four coats with topcoat for photos, but this can also be used as a topper. The formula was fine, though a bit brush-strokey, and I had no issues getting the glitter out of the bottle. 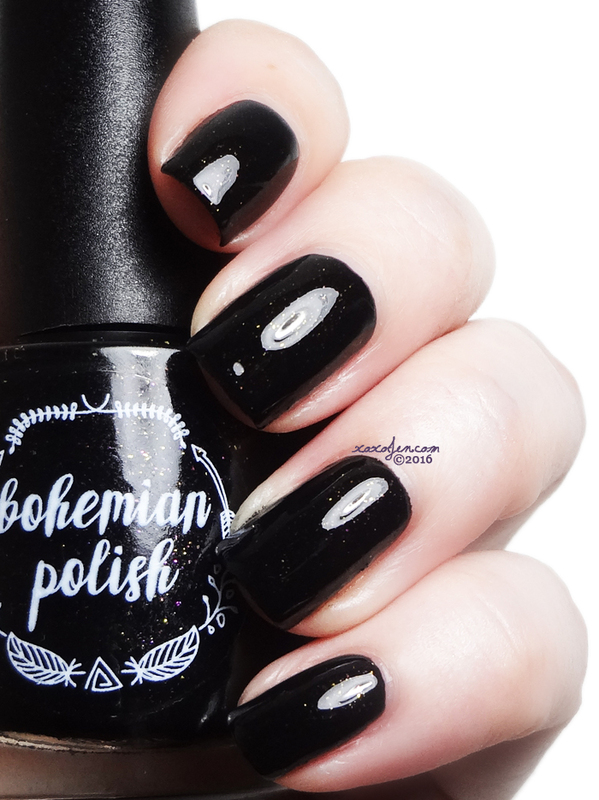 Bob-omb.com - an explosive black polish with hints of red, pink and gold shimmer. I was surprised how rich and dark this black polish is. It seems unusual to me to find one that is nearly one coater. I did experience some trouble with the formula and contacted Jennifer about it. She responded quickly and assured me that the issue would be addressed/corrected before launch. I wore two coats for the photos. It’s A-Me! - inspired by the main man himself! 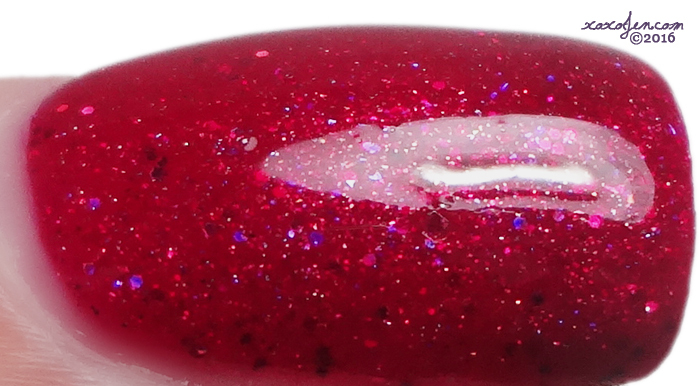 a darkened candy apple red jelly with red and varying sizes of holo and iridescent glitter. I couldn't quite capture the richness of this shade without loosing detail, but I got as close as I could. I wore one coat - yep you read that right. I couldn't believe how well it covered in one coat, formula was smooth and easy to work with although I found the brush a bit coarse/thick which made it difficult to get super close to the cuticle line without needing a lot of clean up. That aside, this one is awesome! Gimme A Boost and Call Me Invincible - a stunning medium violet (almost orchid) holographic polish inspired by the new purple boost stars from New Super Mario Bros. U. I love this shade, perfect for any season. I wore two coats on two nails and one coat on the other two - can you guess which? 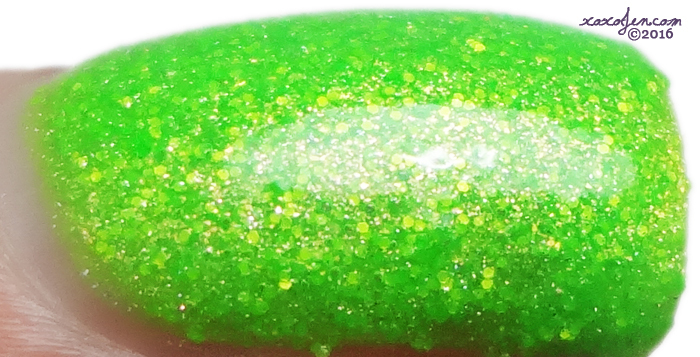 He'll Eat Anyything - a neon green jelly packed with matte gold glitter and a sprinkle of holo pigment and glitter, inspired by everyone's favorite hungry dinosaur. What a bright fun polish! I wore two coats for the photos, and stamped it for Easter nails! I'm excited to see what each month will be as the boxes roll out. The best part is, that you can choose each month whether or not to purchase the box. There is no automatic invoice or obligation. Fantastic, yes?! I'd say so! I hope you've enjoyed my review - come back and see me soon! What a fun looking box this this. Love the Mario theme to it. LOL wonder who that might be? 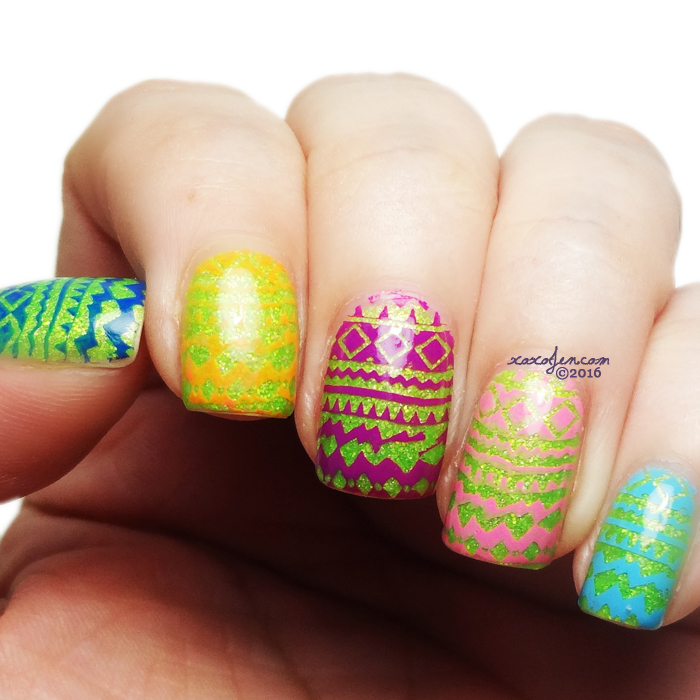 Love the neon green and the stamping you did over it, now I' inspired to get some new neons! OMG I have to have it! I've always been a Mario fan since my childhood! I love these polishes, but the theme didn't really excite me. I can't wait to see what else they come up with tho! Perhaps there will be a fandom you love soon! I love Mario! This is a fantastic looking collab! This box reminds me of when I had the original Nintendo; you know the grey one? Lol. I actually still have it but it just doesn't work anymore. We have one of those too and it still works! That lemming is just gorge!! I think it's my fave in the box! So pretty shades. Loved your mani !! Thank you! I really enjoyed that one!